Review present and predicted tuition and fees for Boston Baptist College, and just how these charges contrast to regional and nationwide averages. Prepare yourself economically for your degree. Contrast Boston Baptist College's fees and tuition to other typical universities and colleges. Look for tuition trends and increases to find out if you should expect to set aside more resources for the following 4 years of paying for college. How do Fees & Tuition at Boston Baptist College Compare to Other Colleges? For nationwide, regional and statewide comparisons, check out the following table to find out how Boston Baptist College compares to other colleges. Full-time students at Boston Baptist College were charged $12,600 in fees and tuition in the 2017 - 2018 school year, prior to corrections for financial aid. From this total, the price of tuition was $11,400. $1,200 was the price of fees. Unfortunately, this college doesn't offer any reductions to in-state students. Boston Baptist College fees and tuition is the number billed to undergrads for one year of attendance, and does not include room and board. Keep in mind a lot of students obtain financial aid and scholarships that decrease their total cost. How much does Boston Baptist College cost part time? For more information, click Boston Baptist College Part Time Tuition & Fees. Tuition and fees at Boston Baptist College have remained stable over the past 5 years. We predict the price of fees and tuition for this year will be $12,575. If prices continue to remain stable, two years here will cost you $25,124 and four years will cost you $50,149. On top of that, you may have additional expenses for room and board, books and, transportation. 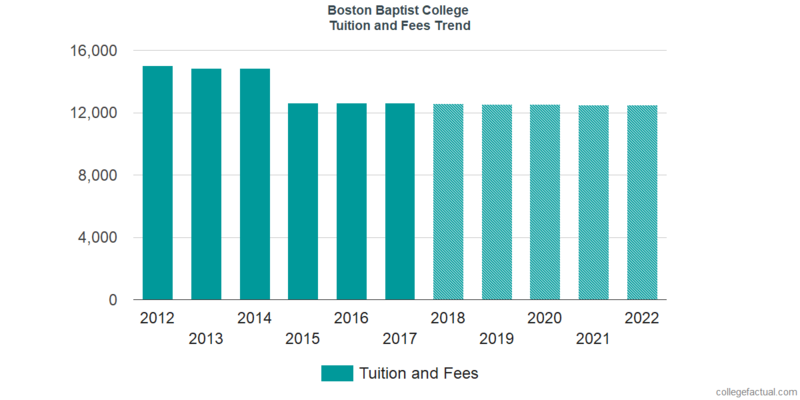 View projected potential tuition and fees for Boston Baptist College students in the next chart. At many colleges you'll wind up paying more in your final year of school than you will in your first. This is due to yearly cost growth. It's good to keep yourself informed!